I just read about the Newmarket (NH) Heritage Festival taking place Sept. 19-21 and it sounds very cool. It's the 11th annual -- how come I've never heard of this before now? Anyway, what first attracted my attention was the kayak and boat tours on the Lamprey River. They also have flyfishing workshops, a climbing wall, historic exhibits, and lots of multicultural entertainment of the singing and dancing kind. There's a Bavarian Band, a Latin Band that will host a Caribbean dance party, and a Canadian fiddler...all this in a small New England mill town! I'm marking my calendar so that I don't miss the Extreme Air Jump Rope Demo and Workshop on Saturday, Sept. 20. I have a new fascination with and appreciation for jumping rope ever since I was challenged by my doctor to try it as a way to build bone density. Don't laugh -- (yes, everything jiggles). So far I'm only up to about two minutes per session, but I can definitely appreciate the stamina and skill it takes to keep the rope going. See you at the Festival! What a beautiful summer day! We left our "to do" list for another day and took our bikes out to Mine Falls Park in Nashua. This is a classic case of almost overlooking what's in our own backyard. Mine Falls is about 4 or 5 miles from our house, in the heart of the city. It's a 325-acre woodland between the Nashua River and the Nashua Canal. We certainly were familiar with Mine Falls before today...we cheered on our youngest daughter at many a soccer game there back when she was playing. We've also kayaked the Nashua Canal and had even walked a trail or two. But today was really the first time we explored several trails by bike and I have to say, I think we'll be returning often. This place is easy to get to and it's cool. The trail surface at Mine Falls is mixed, but very rideable. Short sections are paved and the rest is mostly hard-packed dirt. The Park has a series of intersecting loop trails, which are part of the New Hampshire Heritage Trail. Don't ask me the trail names or the mileage -- all I know is that we crisscrossed the Park and were often riding alongside the picturesque river or the canal. In a few spots, the road noise from the Everett Turnpike is pretty loud, but otherwise this is a very pleasant ride. We spotted a Great Blue Heron, a turtle sunning itself on a log, and several ducks napping. Mine Falls is a fairly busy spot -- you'll be sharing the trail with other bicyclists, walkers, and joggers. But don't let the busy-ness or the intermittent noise scare you off from enjoying the park. It really is a small oasis in the heart of the city. A guy named Chuck who writes Hiking with Chuck has an incredible amount of information about Mine Falls on his website, including some trivia. Apparently Chuck jogs or walks MF at least once a week. Aside from detailed information about the flora and fauna you can see there, Chuck has some interesting observations and stories about the wildlife he's encountered in the Park. We're hoping to return before too long, possibly to launch our kayaks onto the river from one of two boat launches. Maybe we'll see you on the trail or on the water! Things to Know Before You Go: There are orange markers trailside, indicating poison ivy. Sorry, I can't recall seeing any facilities here, although there may be some near the soccer fields. Directions: Mine Falls has several access points. We entered the park from the end of Simon Street, off of West Hollis Street. You can also enter at the end of Coliseum Avenue in Nashua or near the Conway Arena on Riverside Street (near Nashua High South). I realize these are general directions only, but at least it gives you some starting points. We kayaked Hubbard Pond in Rindge (NH) for a little over an hour on Monday. While it was nice enough, Doug and I agreed that it's not one of our favorites. 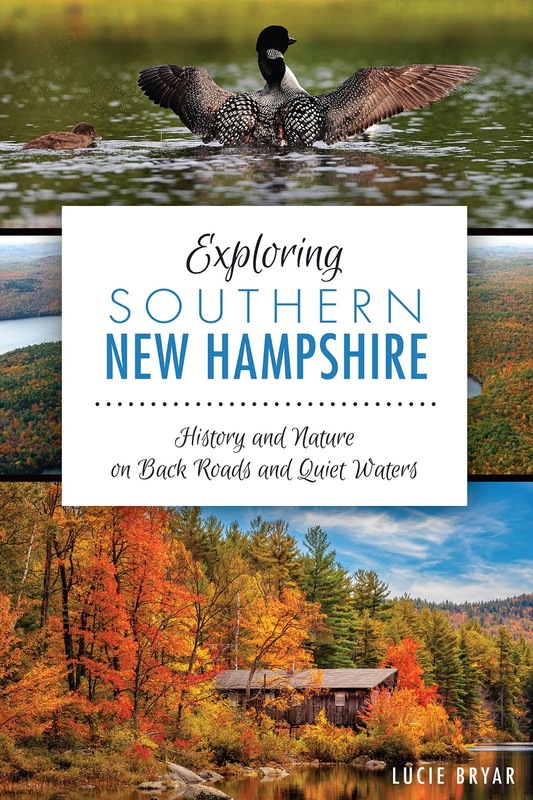 But don't let our opinion discourage you from trying it -- this pond has had great reviews from others (including our favorite authors of the AMC Guide to Quiet Water NH and Vermont). A highlight for me was our picnic lunch at nearby Cathedral of the Pines. More on that in a minute. For now, let me tell you why we weren't so impressed with Hubbard. For starters, the access road (.4 mile of dirt) is very rough. We're talking deep ruts, mud, and standing water --probably has something to do with our rainy summer! In any case, DO NOT attempt this road without a 4-wheel drive or all-wheel drive vehicle. Second, we had to deal with a wind-driven current. Nothing too bad, but we really had to paddle to control our boats. I guess I shouldn't complain about that...it's good exercise. Lastly, we both found the scenery a little boring. There were lots of lily pads in the water and pine trees dotting the shore, although the AMC Guide says it's beautiful in the fall when you can see the foliage against the backdrop of Mount Monadnock; But to be honest, you really don't see too much of the mountain from the pond. The one good thing is that except for a lone shorefront camp (or marina?) at the southern end, there's absolutely no development on this pond. That's because Annett State Forest literally surrounds Hubbard on three sides. Now on to nearby Cathedral of the Pines. This is a beautiful outdoor place of worship with a stone altar dedicated to all service men and women who have given their lives for our country. Altar of the Nation is set on a hilltop looking out on Mount Monadnock. There are some small but pretty gardens, a number of headstones and a few inspirational monuments. There's also a paved and canopied picnic area where we ate lunch. It's just a nice peaceful place to stop, reflect, and be inspired. You can learn more about Cathedral of the Pines here. Things to Know Before You Go: You should have a 4-wheel or all-wheel drive vehicle to drive this access road. Also, there's logging going on in nearby Annett State Forest, so beware of falling trees as you approach the pond. There are no facilities here. Directions: From Rte. 101w in Peterborough, turn left at stop light onto Route 202 toward Jaffrey. Travel 6 miles to Jaffrey Center intersection; Turn right and then immediate left at next stop light, staying on Rte. 202 to Rindge. Drive 3.8 miles before turning left at stop light intersection with Rte. 119. Travel 1.5 miles to first blinking yellow light intersection where you will turn left on Cathedral Road. Follow signs for Cathedral of the Pines and after passing the entrance, drive another .7 miles to the access road. It's easy to miss, but it's a sharp curve on the right. If you are out there kayaking or canoeing, enjoying New Hampshire's beautiful lakes and ponds, you can take an important step to help protect our waterways. Last month, as we finished our paddle at Thorndike Pond in Jaffrey, a young man approached us and asked where we had last kayaked. He wasn't being nosy; he was a volunteer (or paid employee?) for the New Hampshire Lakes Association who was there to educate boaters about the need to wash their boats after each outing. The reason? To prevent the spread of aquatic plants, like variable milfoil, from lake to lake. According to the NH Lakes Association web site, "Exotic aquatic plant infestations in lakes and ponds are undesirable because they make recreation in and on the water dangerous and unpleasant, disrupt the ecological balance of these water bodies, reduce shoreline property values, and are difficult and expensive to control." It's simple. If you want to continue to enjoy the water, please take a few minutes to hose down your canoe or kayak after each outing! My friend Nancy and I took a short paddle on the Exeter River last week. I had read mixed reviews about it on online. One paddler said the river wasn't worth the trip--it was boring and you could hear road noise the whole time. Another couple gave it "two thumbs up." In the end, I went with my trusty source, the AMC Guide to Quiet Water New Hampshire and Vermont and decided to give it a try. This was a short paddle (a little over one hour) and to be honest, we didn't cover a lot of distance. But I enjoyed the river nonetheless. Exeter River is not like some of the crystal clear ponds we've paddled in more remote locations. But it's a nice little adventure if you take it as it is. We put in at Gilman Park and followed the advice of some fellow paddlers to head right from the boat launch. The water is murky and there are lots of dead trees on the banks, giving the whole experience a somber note. At the same time, I found it peaceful. This is a narrow windy river that snakes around for about 6 miles. The snaking part is exactly what I liked about it. You never knew what you were going to find around the next bend in the river. In the short distance we covered, we didn't see many places to go ashore because of the dense shrubbery and trees, but the other couple who paddled for three and a half hours reported that there were several spots to pull over for a picnic lunch. They also saw turtles, ducks, a red-tailed hawk, and a bald eagle. (Read their full report here on paddling.net.) I'd definitely recommend you get out on the river and experience it for yourself. Then come here and let us know what you found. A safety side note: If you're in New Hampshire, you know what kind of crazy weather we've had this summer-- rain, rain, and then more rain, along with a tornado and flash flooding. Not the best of times for those of us who enjoy paddling. While we were out on the Exeter River, we kept a close eye on a dark ominous cloud and we were never more than a few paddle strokes from shore. Be sure to scope out each situation and use common sense. Things to Know Before You Go: There's limited parking -- maybe for 4 to 6 vehicles, so try to avoid busy weekends if you can. Nearby downtown Exeter has some great lunch spots. Nancy and I enjoyed delicious salads outdoors at The Green Bean. There's also a place called Loaf and Ladle that's supposed to be good, as well as other options. Directions: From the junction of Routes 27, 101, and 108 in downtown Exeter, head south on Route 108. Go .7 mile, passing Phillips Exeter Academy and turn left on Bell Avenue just after a bridge. The entrance to Gilman Park is .3 mile down this road.